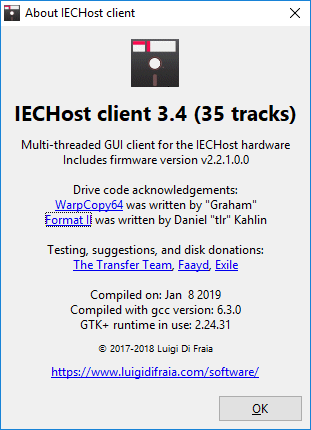 Along with officially releasing TAPClean 0.38 on Sourceforge, I made version 0.40 of TAPClean Front End and version 3.4 of the IECHost GUI client available within my Software page. This entry was posted in Retrocomputing, Technical and tagged Commodore 64, disks, dumping, Embedded system, Firmware, IECHost, preservation, software, TAPClean, tapes, TCFE. Bookmark the permalink. Yep, the scanner needs a complete rewrite at some point as it does have an arguably unnecessary requirement on header contents being blank after the 16-char filename. I had to patch such expectation in order to support “Micrus Copy” too, so it’s probably about time to change the code to extend support. Aren’t packages refers stll to 0.38 version? Which software are you talking about? Version 0.38 refers to TAPClean and version 0.40 to TAPClean Front End. Front End. Currently link is broken. 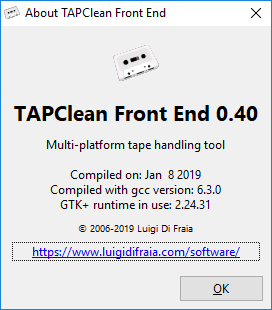 The link for the entire Windows-package says “TAPClean Front End 0.39 for Windows” but when hovering you get: tapcleanfe-0.40-“yada-yada”. Seems only two of the five files under TCFE downloads have a complete link, you need to copy and paste a little to get it working on the other ones – or some relative file link is missing. On my side at least. Again – great job, thanks for helping with tape data preservation.